The Falcon, as a few readers guessed before seeing the cover, is George B. McClellan. The falcon cannot hear the falconer, so the poem goes, and it certainly describes McClellan and various and sundry parts of the federal government through 1862. 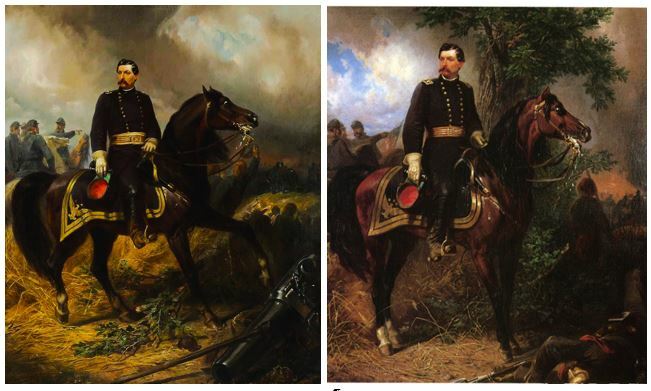 I had two choices for a cover portrait of McClellan and his horse – a character of sorts himself – Daniel Webster. They’re above and, obviously, startlingly similar. The one on the right was painted in early 1862, the one on the left after the battle of Antietam, September 17, 1862. Both are originals, both painted by Christian Schussele. Beside being a good artist, Christian was apparently a good businessman and excellent judge of marketing trends. Antietam was perceived as a victory, McClellan the savior of the North, he and it were on the cover of every newspaper and magazine . . . and Christian Schussele had a perfect representation of the idol of the week in his studio. So, out went the tree, in went some ominous war-clouds, in went a wrecked cannon in the lower right hand corner and …. voila! McClellan at Antietam is born while the news is still fresh. I choose this McClellan for the cover of The Falcon for the irony of it – McClellan was on the actual field of battle at Antietam for a very, very short time – just long enough, in fact, to satisfy – in his mind – his preconceived notions of what had occurred and toss away a very real chance at ending the war that afternoon. This portrait of McClellan, then, is a fraud on many levels . . . and suits my purposes. By the time readers get through the beginning of A Widening Gyre, I think they’ll see it as well. This entry was tagged Antietam, Christian Schussele, George McClellan, McClellan at Antietam, The Falcon, William Hanlin. Bookmark the permalink.